We stop pest pigeons from nesting under your solar panels. Kent Bird Control Services install solar panel proofing to keep pigeons out! 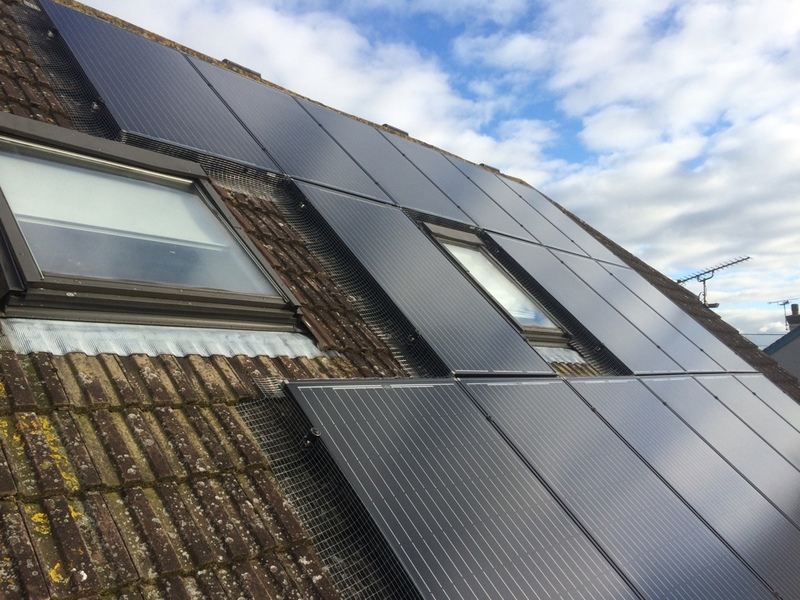 Solar panels provide a safe, warm and dry environment for nesting pigeons. We have seen a vast increase in enquiries from local businesses and domestic customers who have discovered their panels being used as hotels! Apart from the noise, cooing and scratching around at all times of day the pigeons could be causing damage to the roof. The acidic content in bird waste can decay the connection blocks and the wiring and connection blocks under the panels which could create faults and cause the panels to stop working. There are other associated problems caused by a pigeon infestation under your solar panels. Bird guano is not only a health hazard, carrying a number of known parasites and diseases, but there is a high possibility that your gutters and downpipes will become blocked from bird waste. One thing often not considered is the contamination or rain water in water collection butts. Kent Bird Control Services can help solve this problem by installing a long lasting, robust, bird deterrent system that fits all types of solar panel systems. How we can help you get rid of birds. We are very experienced in this type of work as it is one of the most common problems we deal with. We have worked on many types of roofs and where we can work safely there will be no need for scaffold to be erected. However, depending on the pitch of your roof, the layout of the solar panels and all round access it may be necessary to have a scaffold platform erected to act as access and fall arrest – safety is paramount to what we do. But do not despair! We linked up with a scaffold company some years ago who offer preferential rates for our customers. All we need is your address or a photo of the area (rear, front garden showing panels on roof) and we will take it from there. The whole process is handled by us so you don’t have to worry about a thing! You can see what our customers think here. Installing solar panel pigeon protection in Kent.